Benjamin T. Walton (1852-1914), was born on February 7, 1852 at Philadelphia, son of Benjamin T. Walton an immigrant from England and his wife Alice T. Boyer a native of Philadelphia. In the 1880 U. S. Census he is listed as a clerk living at 1109 Marlborough Street, Philadelphia with his wife Josephine E. Day (1848-1925), their two sons and his sister Eliza, a schoolteacher. He worked as the Cashier of the Ninth National Bank, Philadelphia from 1886 to 1914. 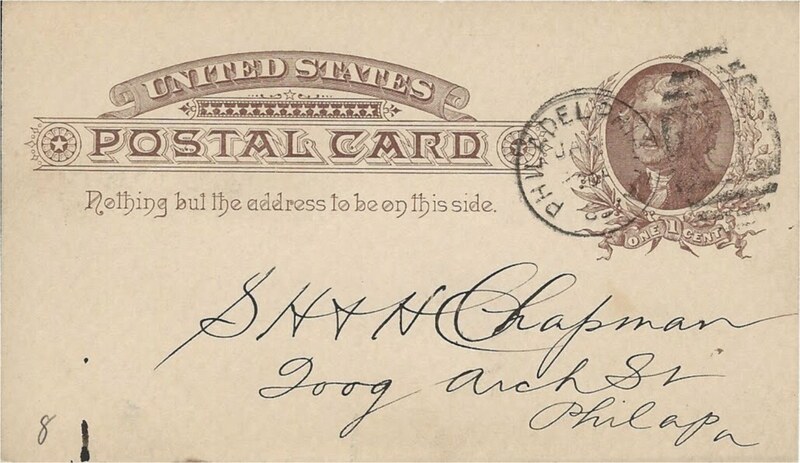 He was also a part-time coin dealer and corresponded with the Chapman Brothers to buy and sell numismatic material. In 1886 he had one of the twenty 1875 Brilliant Proof $3 Gold pieces to sell the Chapman Brothers. Fig. 1. Postal Card (Scott UX8 PC4 1c brown buff) - Leavitt postmarked (Clarke #240d) January 13, 1886, 4:30 PM, sent by Walton to the Chapman Brothers. Fig. 2. 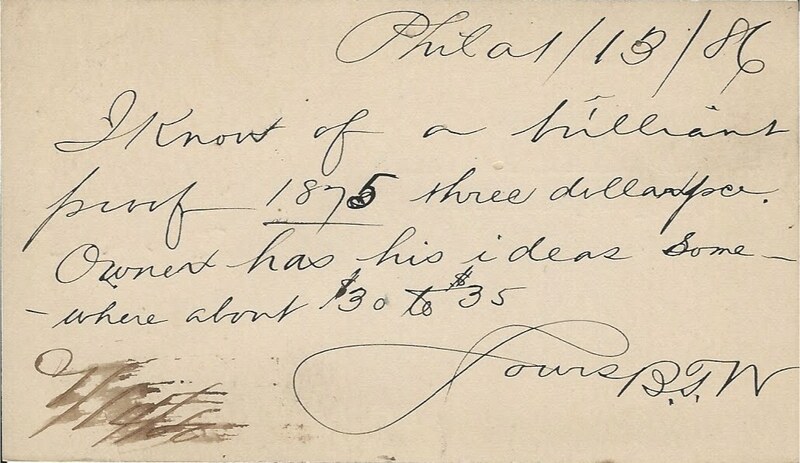 Postal Card of January 13, 1886 "I know of a brilliant proof 1875 three dollar p[ie]ce. Owner has his ideas somewhere about $30 to $35. Yours BTW" Chapman annotation in brown ink smudged 1/14/86. Fig. 3. Postal Card (Scott UX8 PC4 1c brown buff) - Leavitt postmarked (Clarke #240d) January 16, 1886, 5 PM, sent by Walton to the Chapman Brothers. Fig. 4. 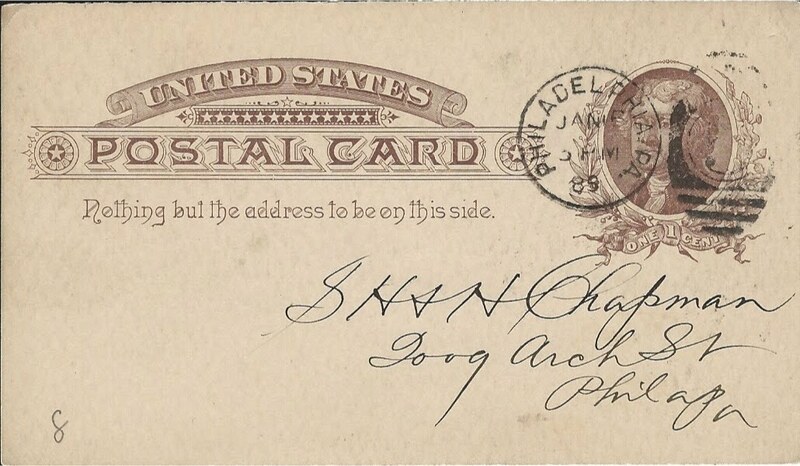 Postal Card of January 16, 1886. 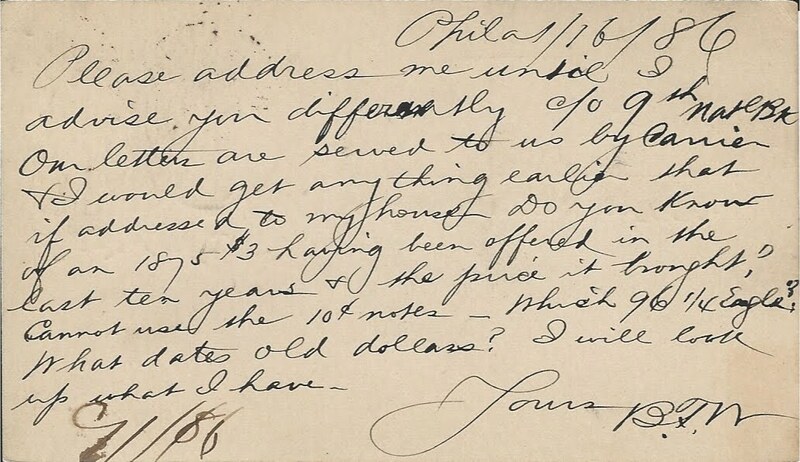 "Please address me until I advise you differently c/o 9th Nat'l Bank. Our letters are served to us by carrier & I would get anything earlier that if addressed to my house. Do you know of an 1875 $3 having been offered in the last ten years & the price it brought? Cannot use the 10 c notes-- which '96 1/4 Eagle? What dates old dollars? I will look up what I have. Yours BTW" Chapman annotation in brown ink with pentimento in date 1/86. Sometimes it is difficult to ascertain if the Chapman Brothers were offering a coin or making inquiries to Walton if he had the coin or coins in his inventory to sell them. The above postal card is one such example. Were the Chapman Brothers trying to sell Walton a 1796 quarter eagle without informing him which variety, or were they asking him if he had a 1796 quarter eagle regardless of variety? The final question asked by Walton seems to suggest the Chapman Brothers were asking him, without giving specific dates, if he had any "old dollars" in stock. If this is the correct reading then it strengthens the view that they were asking Walton if he had a 1796 quarter eagle in his inventory to sell them regardless of which variety, with or without stars. From 1901 until his death he was elected Treasurer of the Pitman Masonic Club. In 1908 he was president of Fair Chance Building and Loan Association. In 1913 he was appointed Treasurer of the Pitman Cottagers Association. He died on November 8, 1914 from cerebral hemorrhage and nephritis at his residence 1304 East Columbia Avenue, Philadelphia.. He is buried in North Cedar Hill Cemetery. He was a member of the William C. Hamilton Freemasons Lodge No. 500, the Melita Royal Arch Masons, Chapter 284, the Knights of the Golden Eagle, Wooton Castle, No. 234 of Bristol, and the Kensington Methodist Episcopal "Old Brick" Church.